This time I will be reviewing the 3 best sites place download software version of Google. With the keyword download software for free, only the site provides official software which I will discuss, and not including software download site that is illegal. 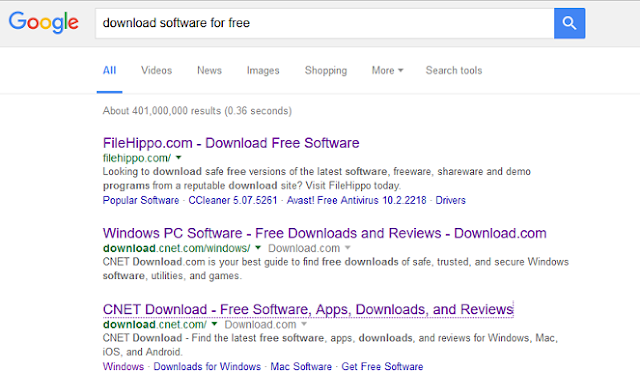 This is the 3 best site download free software to your PC. I am currently accessing Google search from location Indonesia, august 24, 2016, at approximately 8.22 am GMT+7 (Jakarta time). Congratulation to the website of FileHippo.com. This site grabbed the first rank in Google search. In terms of the look is quite simple. And also provides a complete set of software starting from the initial version to the latest version. All arranged neatly. Any server speed is very fast when download from Indonesia. In addition this software only provides free software that is most popular and most widely used. Ads on the show are not too disruptive visitors and also display advertisements. So this site is included in the white list of ad block plus. This site is only reasonable then grabbed the first rank. This site provides software for windows, Mac and web Apps. Those are also the latest news content. CNET is a great site that grabs the second and the third. This site is very complete. Provides software and applications for windows, Mac OS and Android as well. In addition, this site also contains a review of the application or game be it software and games for windows, Mac and also android. There is also recent news. For advertising, it looks like this site is only showing the site natively from taboola. And ads from Google adsense does not appear when I use Mozilla browser, there is adblock plus. For the look, in my opinion it is still inferior to the site of FileHippo. That’s the 3 best sites version of Google search. With the keyword free software download for PC.